The French House Duo Guy-Manuel de Homem-Christo and Thomas Bangalter aka Daft Punk’s debut CD, Homework, was an unlikely candidate to reach the double-platinum sales mark. In a musical climate that was focused on the rise of bands like the Prodigy and Chemical Brothers, Daft Punk’s house-inspired fusion debut was a refreshing look back at the roots of dance/club/electronic music with a truly original feel. On their second album Discovery, Daft Punk replace the ‘80s synthesizers and drum machines and embrace vintage disco with garage house and synthpop overtones. The debut single from Discovery, the impossibly catchy "One More Time," sort of sounds like a Giorgio Moroder remix of Kool and the Gang’s "Celebration." There are also nods to E.L.O. ("Digital Love"), Mannheim Steamroller ("Veridis Quo"), funk pioneers ("Aerodynamic" and "Crescendolls"), the French electronic group Air ("Night Vision" and "Voyager"), and R&B ("Face to Face"). Discovery isn’t as conceptually intriguing as Homework nor as their later releases, and it lacks any real dance floor burners aside from "One More Time." Instead of going for the easy carbon-copy sophomore release, Daft Punk go off in an entirely new direction. Homework worked for anyone who was a fan of classic dance music. Discovery, on the other hand, goes overboard on the disco influence and probably alienated a good portion of the band’s followers. While one has to salute Daft Punk’s courage in pursuing this new direction, there’s only so much of that four-on-the-floor sound that one can take. However, it must be noted that Rolling Stone magazine included Discovery on their list of The 30 Greatest EDM Albums of All Time so there is probably more to this than what you hear in one listen. 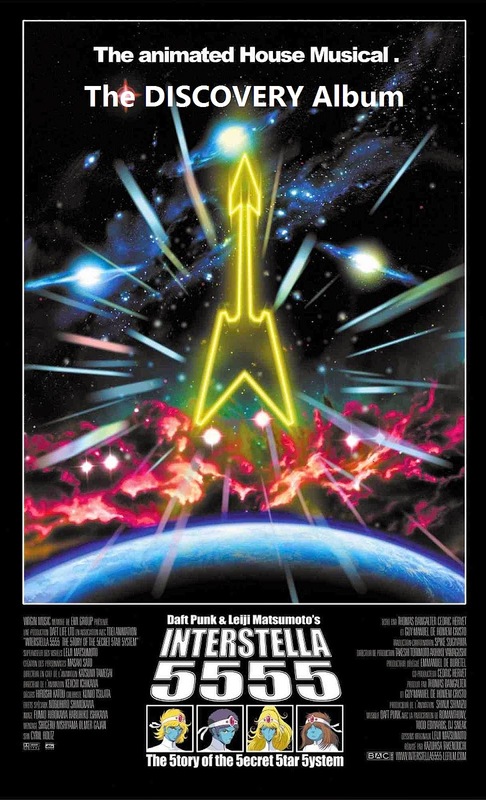 Incidentally, Discovery also later resurfaced again in 2003 as the soundtrack for Interstella 5555: The 5tory of the 5ecret 5tar 5ystem, an scifi adventure anime film directed by Kazuhisa Takenouchi that was made in collaboration between Daft Punk, Japanese manga creator Leiji Matsumoto (known for Space Battleship Yamato), and the leading Japanese anime/manga company Toei Animation.